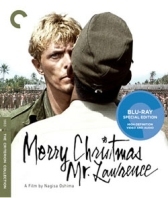 It’s 1942 on the island of Java where Tom Conti and David Bowie star as two British POWs in Nagisa Oshima’s Merry Christmas Mr. Lawrence. The film received a mixed reception upon its release in 1983, and it’s easy to see why it divided critics in such a way. The film deals with two sets of officers; two stern Japanese disciplinarians bound by the samurai code, Capt. Yoni (Ryûichi Sakamoto) and Sgt. Gengo Hara (Takeshi Kitano), and two upper-class British officers, Col. John Lawrence (Conti) and Maj. Jack ‘Strafer’ Celliers (Bowie). It’s not only their cultural backgrounds that contrast these two sets of characters, but also their acting styles. Both Bowie and Conti are traditionally Western in their performances, whilst Sakamoto and Kitano belong to a very traditional form of Japanese over-acting which – whilst appropriate in Japanese cinema – seems completely disjointed against a more subtle, Western approach. This is the central problem of the film; it fails to work in its totality. The contrast of cultures and military styles is an interesting idea. Lawrence – who acts as the translator – also functions as the mediator between East and West, attempting to explain to each culture why they behave the way they do. In Europe, two versions were released – one with subtitles and one without. The idea of the latter was to place the audience in the situation of the British soldiers, who, for the most part, would not understand what was being said around them. Merry Christmas Mr. Lawrence’s other problem is an overload of themes. It embraces religion, the nature of military service, prison, cultural philosophies, psychology and homosexuality, leading to a disjointed production which, whilst noble in its endeavour, ultimately falls flat. Ultimately, the attempt to over-deliver on themes leads to a serious under-delivery of dramatic impact. This is a disjointed film, inexplicably a classic for some, that fails to engage with modern audiences.